The treasures that I find while traveling always become my favorite things in my home because of the memories and stories behind them. Case in point, my ever-growing collection of Apulian ceramics. I really don’t know where to stop with this infatuation but it actually all began long before I stumbled upon the very source in Italy. Against my obstinate declarations of not having a wedding registry, I eventually caved upon realizing I could set one up at my favorite store in San Francisco. When I first moved to San Francisco, March underwent a major overhaul in 2010 from being solely antique furnishings to include an incredibly well curated selection of kitchenware. I had always been drawn to their punchy colored ceramics they had stacked in color order down their alleyway but I never fully committed to a set - I’ve always been drawn to color but sometimes hesitate to add too much of it to my home. I ended up having a few years to ruminate on these pieces and it turns out that I actually love them as much now as the day I first saw them - the colors just as enchanting. It was really special that our friends ended up gifting us so many beautiful pieces in celebration of our marriage. For that reason they will always be very significant to us - reminding us both of the city we fell in love in as well as the lifelong friends we made there. Fast forward to over a year later (we had an unintentionally long engagement, you can read about that here) and we were jetting off to Italy to celebrate our marriage. On one of our final days of our trip, we decided to wing it and explore an obscure town that was rumored to have lots of ceramics or “ceramiche” as the Italians would say. Now, my husband isn’t really one for shopping but he is all for a good deal, so what we came across was equally thrilling on both ends. 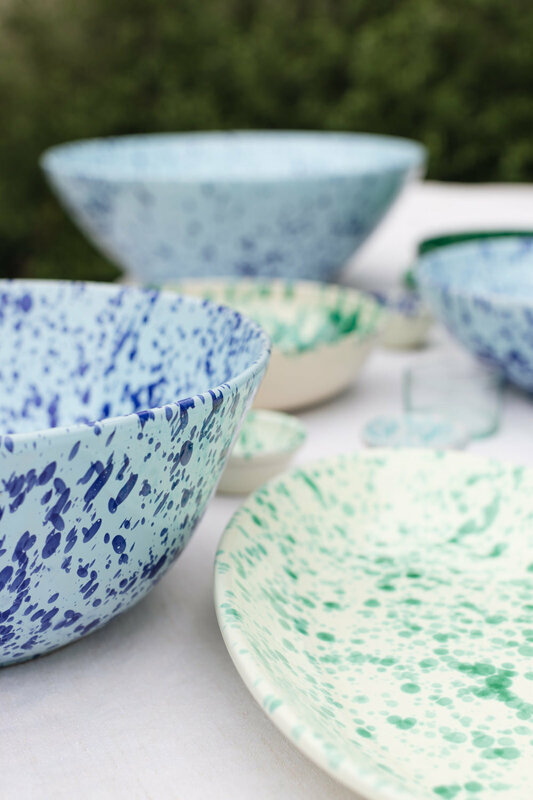 As soon as we stumbled into the first ceramic store, my heart skipped a beat, it was the same supplier for the beloved bowls we had back at home! Too excited to fully digest how insanely serendipitous this was, my money turned to confetti and I convinced myself I could use just about every dish, bowl, and mug I could get my hands on. The color options were ENDLESS and when I say endless I mean, it was debilitating to make decisions. I’m pretty sure at one point I decided it was more important to divide and conquer and left my poor husband haggling with a shopkeeper while I continued on. I settled on a palette of colors of the sea because I knew it would remind me of our trip for years to come. Somehow, I exercised a fair amount of self control and only took back as much as we could fit in our carry-on. Quite miraculously, everything made it home without a scratch. The history of these pieces is a bit of a fairytale and learning more about it in Italy made my affinity even stronger. The method for achieving the speckled appearance is by flicking the paint on with olive branches and the colors are said to be inspired by the deep blues and greens of the Adriatic and Ionian seas. To think of these details every time we see our plates and bowls fills my heart with nostalgia for our wedding and for our time spent in Italy. I can’t wait to make a trip back soon and scoop up even more of these incredibly beautiful pieces. A fun, affordable, and easily accessible version of this style bowl are listed below. They are not ceramic, rather they are made from steel and powder coat enamel. They are super durable so they are great for outdoor entertaining. I have a few of these that I use for food prep! Another great resource is Crow Canyon.